'Tis the season when, as the Fringe approaches, everyone you've ever known who is involved in a show in the festival throws a fundraiser. And you're invited! After a while the bands-in-a-bar fundraiser formula gets a little repetitive, but there are a couple of innovative Toronto companies who are raising money for their Fringe shows without doing the same old same old. Small Wooden Shoe's ambitious Dedicated to the Revolutions series continues with I Keep Dropping Sh*t - a Fringe show in the MaRS Discovery District that's destined to become a crowd favorite. And Small Wooden Shoe is NOT having a fundraising party! Instead of going to this witty party they're NOT having, they're asking for donations to their Paypal account. Or instead you could buy a pie. 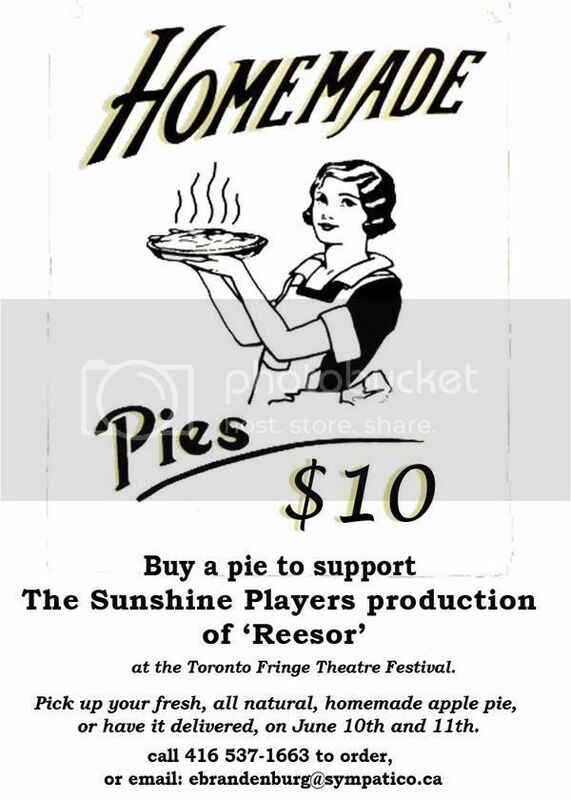 Yes, that's right, The Sunshine Players are presenting Reesor at the Fringe - the true story of a Northern Ontario town that disappeared a few decades ago - and they're selling wholesome, homemade apple pies at ten bucks a pop to raise money for the show. Get your order in by Sunday, June 10 aka pie making day, and as you bite into your flakey apple goodness you can also feel good about supporting the local arts scene.